Violinist Kristin Lee makes her PCMS debut next week with a Philadelphia favorite in guitarist Jason Vieaux. An extremely versatile violinist, she enjoys a varied career as a soloist, recitalist, chamber musician, educator, and artistic director. In our interview below, we discuss her collaborations with Mr. Vieaux and composer Vivian Fung, Ms. Lee's unique chamber music series in Seattle, and the importance of a social media presence as an artist. Jessica Wolford: We’re excited for your PCMS debut on January 23! Our audience is well-acquainted with guitarist Jason Vieaux. Please tell us how did your collaboration with him came about and what do you enjoy as a violinist about playing with a guitarist? Kristin Lee: I first met Jason at a music festival one summer, and we connected by finding out that we are both alumnus of Astral Artists, a Philadelphia-based organization that supports young artists. Our musical collaboration became more significant after premiering a new work for violin and guitar by Vivian Fung, which we will be performing on the PCMS stage. There are couple of things I truly enjoy about playing with the guitar. One is that I really explore the intimate and delicate colors of the violin when I play with the guitar. Secondly, since the guitar is such a versatile instrument for different genres of music, I get to program and perform a wide range of different types of music. JW: You’ll be performing Vivian Fung’s Twist, a piece written specifically for you and Jason. Tell us a little about the piece and about the experience of working with the composer. KL: I first met Vivian as my music theory teacher at the Juilliard School when I was still a student. We built a really beautiful friendship, and she eventually wrote a Violin Concerto for me, which I premiered in 2009. A few years after that, I was given an opportunity to commission some new composers, and I immediately contacted Vivian to write me a work for violin and guitar, which Jason was on board with. Before delving into writing the work, I introduced Jason and Vivian over some Japanese Barbecue dinner, and we all instantly became great friends over talking about what kind of music we like. Vivian took a lot of inspiration from that evening's conversations and came up with the material she includes in Twist. What I love about Vivian's approach to writing works for specific people is that she really values getting to know the person, and takes the inspiration from the individual's personality or traits, and creates her work. JW: You have your own chamber music series, Emerald City Music, in the Puget Sound region of Washington State that debuted just last year (2016-17 season)! Could you tell us about your series and its place in that region of the country? KL: It's been such a rewarding journey to co-found a new chamber music series in Seattle. What I love about Emerald City Music is that we perform our concerts in a unconventional venue—a space that is tucked away behind a cafe, like a speakeasy. We set the room in a round without any boundaries between the audience and the musicians. That way, the idea of a "stage" is nonexistent in this space. We put our best efforts to make classical music more approachable and a great social experience just as much as a listening experience. We've had success bringing many young people to our concerts, and I think that is because we are trying something a bit different. JW: Lastly, what are your thoughts on social media's value to a classical musician? You have a fun presence on Instagram and Facebook. The use of these platforms seems prevalent mostly among young(er) artists (who may also be more inclined to use them on a personal level). Do you believe it’s a necessary tool for one’s musical career in today’s online world? KL: Social media, to me, is the single most powerful way to connect with your fans and audience members in this day and age. I think artists can often be portrayed as a bit of a mystic, but social media allows musicians to share more of their human sides with the world. I think it's crucial for artists to have presence in the social media world to stay relevant and up to date with today's way of communication. Kristin Lee appears with guitarist Jason Vieaux on Tuesday, January 23 at 8 pm at the American Philosophical Society's Benjamin Franklin Hall. For tickets and information, visit the concert page. For more information on Ms. Lee, visit her website. 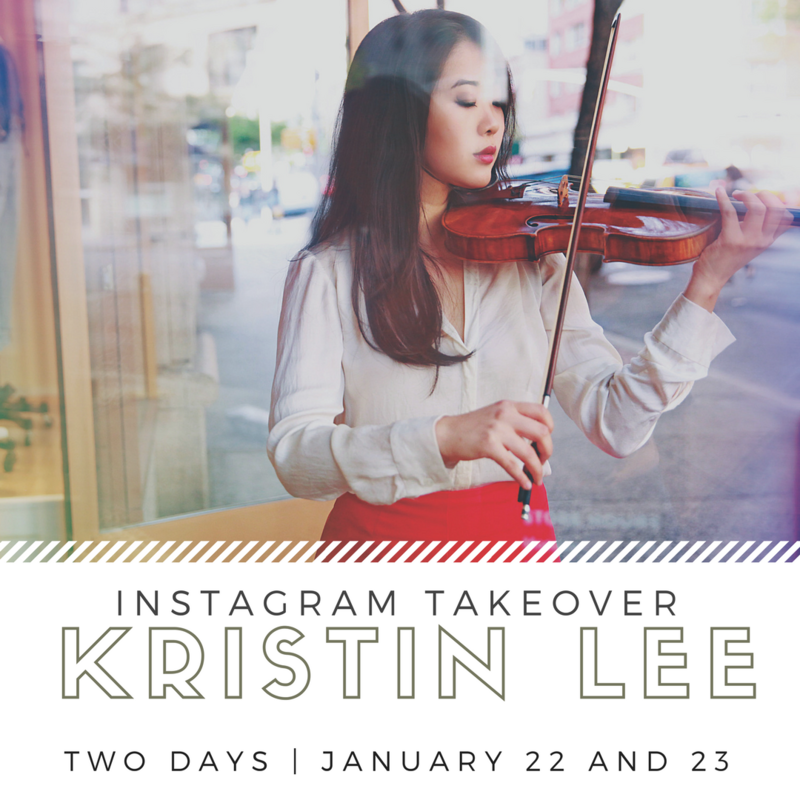 Follow the PCMS Instagram (@pcmsconcerts) as Kristin Lee takes over and shares an exclusive look at rehearsals and the concert!